Radiation therapy can be a frightening prospect for the patient who does not know what to expect. This article sets out, in simple language, to describe what happens at each stage in the process so that patients will have a better understanding of how radiation therapy. In the first part of the process, the patient who has chosen to have radiation therapy goes into a CT (Computed Tomography) Simulation. This is a scan of the part of the patient’s body that will be treated, in this case, the pelvic area. First, a mold of the patient’s feet is taken to help keep the patient from moving around during the scan. Using this scan, the target area for the treatment is identified, whether it is the prostate itself or the prostate bed. This target area is marked using wall-mounted lasers to make three small tattoos on the patient’s skin which show the doctors the approximate area that will receive radiation therapy. At this point, the patient waits at home for up to a week while the doctor and the physicist operating the radiation therapy equipment establish which organs will be exposed to radiation and how much radiation they will be exposed to based on the scans taken during the CT simulation. The information from the scans is transferred into the treatment planning computer, which is then programmed using this data to establish what is the correct dose of radiation for the prostate or prostate bed while minimizing the exposure of other organs and tissues to the radiation. This information is then used in the treatment itself to maximize the chances of a successful, complication-free procedure. 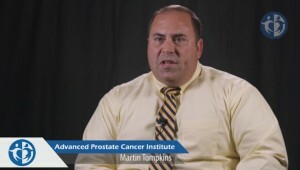 For more information about radiation therapy, visit the Advanced Prostate Cancer Institute.